I live near a park and frequently walk around the local area. Given the amount of dog mess that is on the pavements I thought this book would be the ideal read to stop me having to scrape my shoes on the grass before going home. 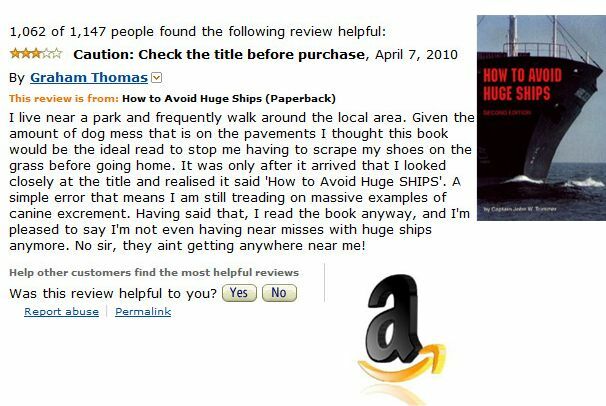 It was only after it arrived that I looked closely at the title and realised it said ‘How to Avoid Huge SHIPS’. A simple error that means I am still treading on massive examples of canine excrement. Having said that, I read the book anyway, and I’m pleased to say I’m not even having near misses with huge ships anymore. No sir, they aint getting anywhere near me!